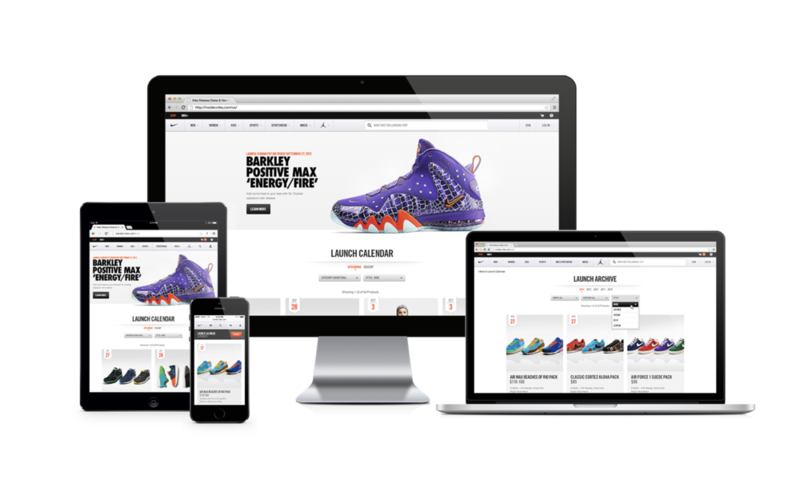 From desktop to tablet, interaction design solutions for Nike.com need to be responsive across all devices, while retaining the premium feel that is true to the existing digital platform and products. Below is a selection of live digital product solutions designed across the spectrum of Nike.com, from newly anticipated releases to saved credit card details. Every day, Nike releases multiple new products or special color options that are highly anticipated. Until recently, there was no dedicated destination across the Nike.com for them to be showcased. The product launch calendar is the go to destination for consumers to discover new products launching from Nike. Consumers can browse products with similar contextual tags and read more about the story behind the product. From tablet to mobile, the view of product launch calendar cards remains optimized to keep the experience clean and clickable. Filtering is context-specfic and regardless of the device, consumers can toggle between product launch years and delve into specific months, categories, or styles. Filtering is prioritized by upcoming product launches. Consumers on the hunt for a specific product can further narrow down by category and style or delve into the archive. To get the whole story, consumers select the launch card and are redirected to luscious photos and product details. A natural destination for consumers from the product launch calendar. The focus is on product details enriched with dramatic photography and purchase options. Previously, customers could not save credit card details in their account settings or on the payment page at checkout. See an overview of payment options across devices and contexts below or log in on Nike.com to see it live. When consumers are making the final decision of which products to buy they need to be confident in the process. Now Nike Running Pros are available to help out.